Dr. Reddy has been teaching both undergraduate and graduate courses and has been equally occupied with funded research activities in the MTE Department. Some of the courses he has been teaching are chemical, metallurgical and materials science and engineering are Thermodynamics, High-temperature materials processing, Chemical metallurgy, Introduction to ceramics, Materials Transport Phenomena, Phase diagrams and Materials engineering design. The courses were received well by both graduate and undergraduate students. High-temperature materials processing laboratory by including several computer-aided experiments were installed to enhance the quality of instruction in undergraduate engineering curriculum. He also taught several short courses in USA and abroad. A detail list of courses is given with course details on some of his recent courses. Course Outline: The purpose of this course is to deliver basic knowledge of Transport Phenomena to the students. Specifically, the course covers introduction and definitions, material and energy balances, momentum transport laminar flow, equation of continuity and conservation of momentum and fluid flow, turbulent flow, mechanical energy balance and its application to fluid flow, transport heat by conduction and convection, transient heat flow , heat transport by thermal radiation, mass transport by diffusion in the solid state, mass transport by diffusion in the solid state, and mass transport in solids. In addition, experiments are demonstrated in laboratories on heat transfer and thermal conductivity measurements, and heat capacity and thermodynamic calculations. Text Book: Thermodynamics, 2nd Edition, by N. A Gokcen and R. G. Reddy, Plenum Press, New York and London, 1996. Course Outline: A continuation of the first course in thermodynamics for upper-class metallurgical engineering students. This course is intended to give a broad review of thermodynamics as applied condensed phases, thermochemistry applied to typical metallurgical processes, graphical representations of equilibria, binary and ternary phase diagrams, heterogeneous equilibrium, behavior of solutions, standard states and electrochemical thermodynamics. As far as the text is concerned, we will proceed through 2, 7 to 14 chapters in the textbook, but we will spends more time on some chapters than the others. 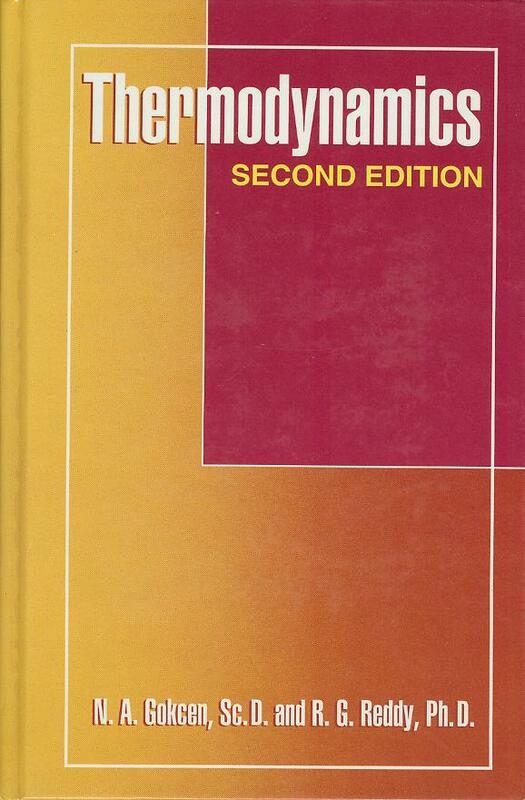 Principles of Extractive Metallurgy, 2nd Ed., Terkel Rosenqvist, McGraw-Hill, Inc., 1983. Thermodynamics of Non-Ferrous Metallurgical Processes-Extractive Metallurgy Lectures, R. G. Reddy, UM Research, Olen, Belgium, 1997. Chemical Metallurgy Laboratory Manual, R. G. Reddy, The University of Alabama, 2003. Course Outline: An upper level course designed for seniors and/or graduate students. This course is aimed at understanding of metal extraction based on first principles, the application of thermodynamics, fluid flow, and heat and mass transfer to the design and operation of common chemical metallurgical processes. Pyro-, Hydro-, and Electro-metallurgical processes involved in extraction of ferrous and non- ferrous metals, application of fundamental concepts to selected topics in iron and steelmaking, and the roasting, smelting, refining of non-ferrous metals such as copper, lead, zinc, aluminum and magnesium are covered. Laboratory experiments on selected topics will be conducted. Computer process calculations and process flow sheets will be analyzed. Course Outline: This course is intended to give a broad review of science and engineering aspects of high temperature materials, ceramics. It is structured to teach students the properties, processing, and chemistry of ceramic materials. Topics include ceramic raw materials, refractories, thermal properties, mechanical properties, processing, advanced ceramics, and etc. As far as the text is concerned, we will proceed through the chapters, in the textbook , but we will spent more time on some chapters than the others. Course Outline: This course is intended to give a broad review of thermodynamic principles as applied to metallurgical and materials processes. As far as the text is concerned, we will proceed through all the chapters in the textbook, but we will spend more time on some chapters than the others. Text Book: R. G. Reddy, Metallurgy Lectures: Phase Diagrams (Thermodynamics and Construction), Presented at MHO, Hoboken, Belgium, 1992. Course Outline: This course is intended to give broad review of principles of phase equilibria; the Gibbs phase rule; chemical potentials; estimation of entropy, enthalpy and heat of fusion and experimental methods in determination of phase diagrams. the constructions of phase diagrams and determination of thermodynamic data from phase diagrams are covered. Stability diagrams construction: metal-sulfur-oxygen systems for pyrometallurgical processes and Eh-pH diagrams for hydrometallurgical processes are presented. Finally, ternary systems, relationship between phase diagrams and thermodynamic data and phase and composition determinations, and cooling paths during cooling of the ternary melts are covered. Computer calculation of phase diagrams for each chapter are discussed. Course Instructor: R. G. Reddy, "Thermodynamics of Non-Ferrous (copper, Lead) Metallurgical Processes" short course was presented. Sponsored by Metallu`rgie Hoboken-Overpelt (MHO), MHO Research Development Technology Center, Belgium, February 2-6, 1992. Course Instructor: R. G. Reddy, "Phase Diagrams-Thermodynamics and Construction"-short course was presented. Sponsored by Union Miniere, Hoboken, Belgium, December 14-18, 1992. Course Instructor: R. G. Reddy: Engineering Education Panel, Speaker, Carbon Management Technology Conference a(CMTC), Orlando, FL, February 7, 2012. National Science Foundation - 3-D Nanomanufacturing, UA-NSF-North Eastern University, Birmingham, AL, Jan 5-6, 2003. National Science Foundation - Environmental Benign Manufacturing, UA-NSF-North Carolina State University, Birmingham, AL,Jan 9-10, 2003. “Fire Assaying” sponsored by Canadian Mineral Analysts, CMA’97, Quebec City, Quebec, Canada, September 14, 1997. National Institute of Technology (NITW): Special Lectures: "Nanoscale Materials - Fundamentals and Processing", Warangal, India, January 30-31, 2013.